Most websites lose high value readers and customers daily because they don’t follow a few easy share button fundamentals. Our last post covered how people use share buttons as infrequently as they click display ads, and this post shows how to overcome barriers to sharing. Facebook sharing is the cornerstone of social visibility for most sites. We highly recommend that you ask readers to Share, not Like, your content because it will reach a larger audience. Facebook has been systematically cutting the reach of brand Pages, leading to what some have called the “Death of Organic Reach”. It’s even worse when people Like a specific page (e.g. an article). As Buffer recently highlighted, Liking a piece of content is a near empty exchange. In contrast, Shares provides reliable, high-quality word-of-mouth exposure to the sharer’s network of friends. The high visibility of each new share adds up, driving extensive engagement. In conclusion, ditch your Like buttons and keep the focus on Sharing. Just because you can add share buttons for a dozen networks doesn’t mean you should. 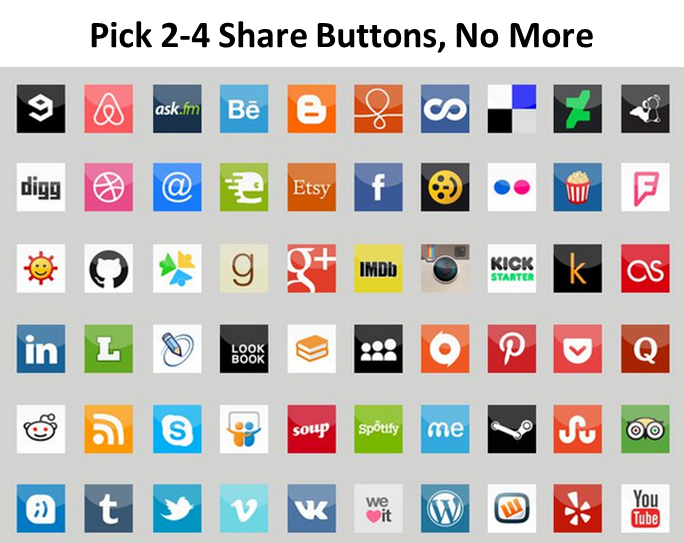 Using too many share options creates visual clutter and can lead to share decision paralysis. We recommend showing just the 2-4 social channels that are most valuable to your brand. Below are some suggested button lineups. We recommend including an email share button with each lineup. Publisher and B2B Lineup: Facebook, Twitter, Linkedin, Google+, Email B2C Product Lineup: Facebook, Twitter, Pinterest, Email B2C Service Lineup: Facebook, Twitter, Linkedin, Email Google+ shares may not come in droves, but they may be indirectly helpful for SEO. You may wonder about other share options, such as Reddit, Stumbleupon, Instagram, etc. There’s potential for these secondary share options to help, but right now Facebook and Twitter are orders of magnitude more important. These two typically account for 85%+ all sharing. If your share buttons aren’t easily seen, readers won’t use them. We recommend using large, colorful share buttons and placing them strategically throughout your page. Placing them just at the top of the page can cost you shares – not everyone will scroll back up to share. While under 10% of sharers will likely use your buttons, share buttons are a key visual call to action that will spur more overall sharing. On sites that don’t use share buttons, people can still share pages manually by copying and sharing the page URL. 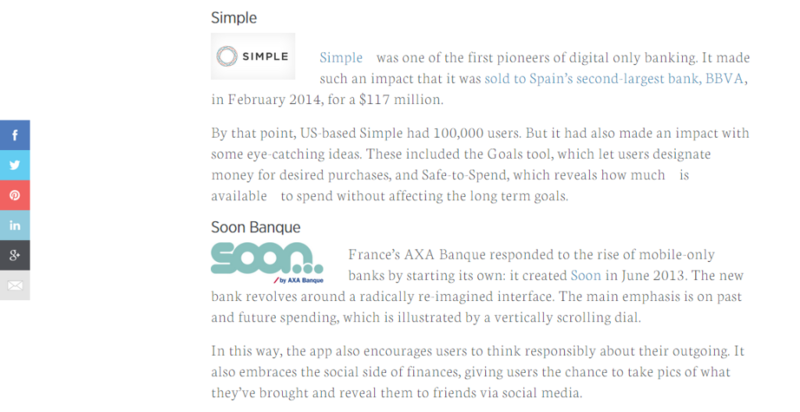 However, forgoing share buttons leaves valuable shares on the table, especially on mobile. If you often have a high volume of sharing for your content we recommend displaying your share counts. High share counts can build trust with visitors and show cultural capital. 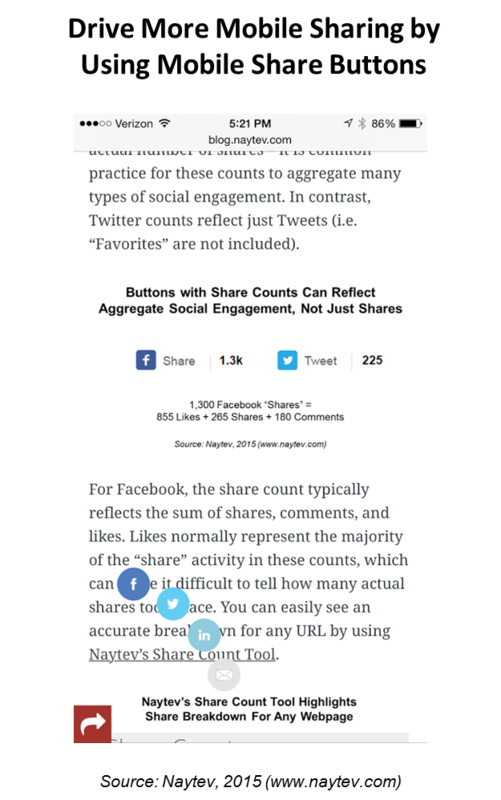 We don’t recommend using share counts unless your content is regularly driving a dozen or more shares per social network you show. With that said, it’s not a problem if you choose to not show share counts; several leading websites don’t use share counts either (e.g. The Washington Post). Site visitors are increasingly engaging with content on the go. 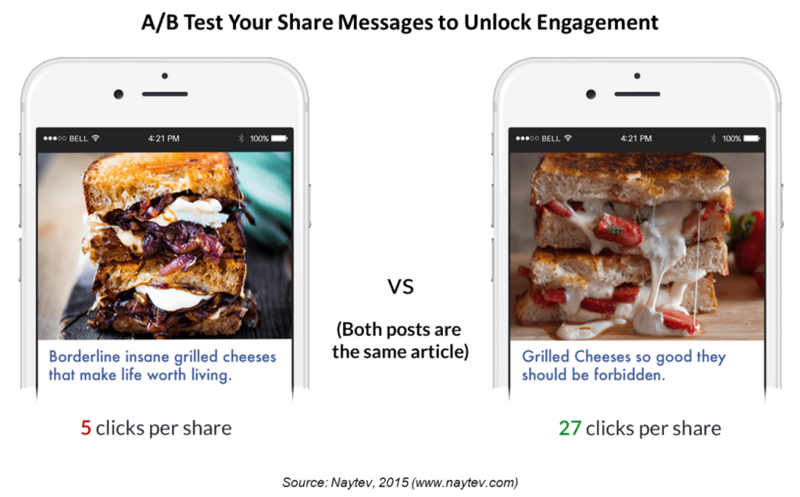 Providing highly visible mobile share buttons is an additional way to drive more engagement. Mobile sharing features can take a variety of different styles, from fixed horizontal buttons to a single button that reveals more options. 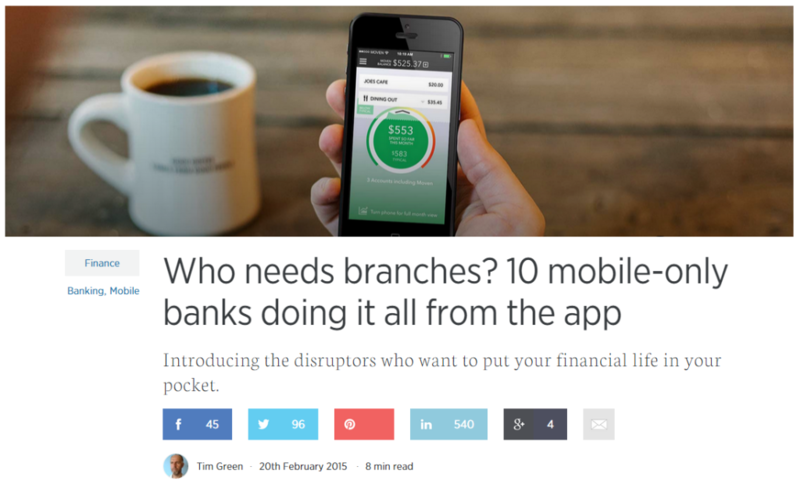 If you view this post from your phone you can see the mobile share buttons that we use. Clicking the red share arrow will reveal several share options. This mobile feature above comes with Naytev’s free share buttons, is fully customizable, and can be turned on with a simple switch. Poorly structured share buttons slow down your page load time, driving away visitors. For context, as many as 25% of visitors will abandon your page if it takes 4 seconds to load. Loading share buttons and counts individually can easily add unnecessary load time. Share buttons that operate independent of one another also require you to add unnecessary lines of code to your site, weighing it down. The Facebook SDK alone is 50kb. Now add Twitter at 35kb and Google+ at 55kb: you’re already up to 140kb. The easiest way to fix this issue is to use share buttons that efficiently load multiple networks simultaneously. 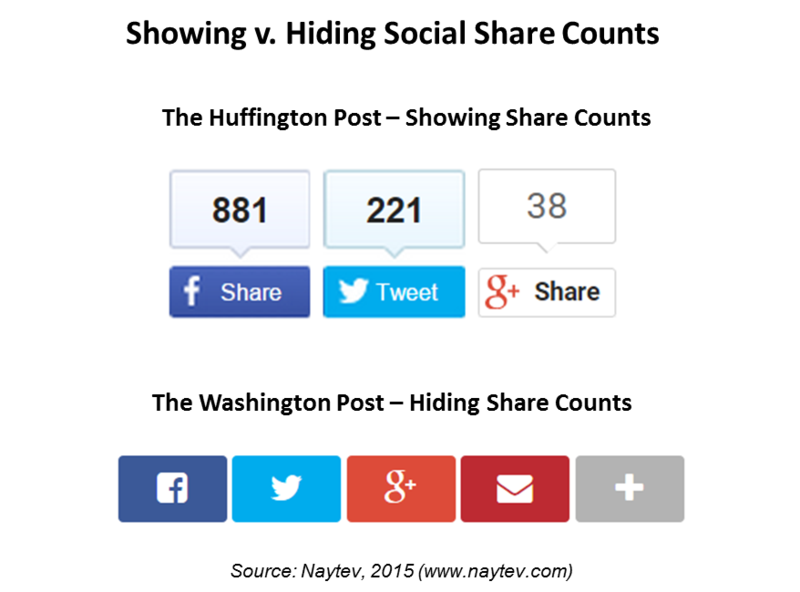 For example, Naytev’s share buttons load all social networks with just 52kb – a 63% reduction in weight. Alternately, if you use your own custom share buttons, you can use our Share Count API to reduce page load time by loading all the share counts in a single HTTP request. 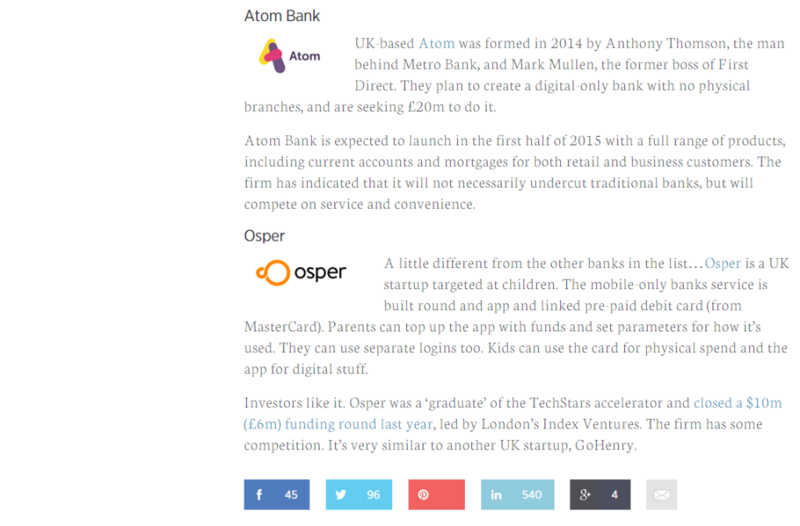 Top publishers and brands now amplify the reach of shares that take place on their websites. Every social share from your site can drive many referral clicks back to your site. The volume of these word-of-mouth visits depends on the quality of your message. Default share messages, defined in your site’s Open Graph (OG) tags, normally use the title and first image on your page. However, these default messages often don’t engage people on social as well as they could. When you don’t test your share messages, you put all your eggs in one basket, and may miss out on thousands of new word-of-mouth visitors monthly. For example, VentureBeat saw a nearly 700% boost in Twitter engagement by simply testing different Tweet messages. Testing messaging manually is prohibitively time intensive – this is why few, if any sites tested messages until Naytev developed its automated share optimization platform. You can try Naytev today for free to drive more social engagement and revenue.